This MSci offers an additional year of study on top of the Mathematics and Physics BSc, during which students have the opportunity to specialise further by taking more advanced modules and completing a major project. A*A*A with A*A* in Mathematics and Further Mathematics and A in Physics, or A*AA with A*A in Mathematics and Further Mathematics and A in Physics, any order, and a 2 in any STEP Paper or a Distinction in the Mathematics AEA. A*A in any order from Mathematics and Further Mathematics, and A in Physics. A score of 20 points in three higher level subjects including 7 in Mathematics and at least 6 in Physics, or 19 points in three higher level subjects including 7 in Mathematics and at least 6 in Physics and a 2 in any STEP paper or a distinction in Mathematics AEA, with no score below 5. A score of 19 points in three higher level subjects including 7 in Mathematics and at least 6 in Physics, with no score below 5. Successful completion of the WBQ Advanced Skills Challenge Certificate plus 2 GCE A-levels at grades A*A*A, or A*AA and a 2 in any STEP paper or Distinction in AEA. To include Physics and Further Mathematics. The MSci programme provides both a broad-based training and in-depth study, particularly suitable if you wish to pursue research in mathematics or physics. 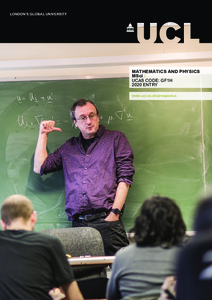 Highly regarded UCL Mathematics is home to world-leading researchers in a wide range of fields, especially geometry, spectral theory, number theory, fluid dynamics and mathematical modelling. Three of the six British winners of the Fields medal (the mathematician's equivalent of the Nobel Prize) have associations with the department. UCL Physics & Astronomy was ranked 5th and UCL Mathematics 6th in the most recent QS World University Rankings by Subject 2017. In the first and second years of the programme you will cover a balanced selection of modules in both UCL Mathematics and UCL Physics & Astronomy. You will take a selection of designated modules in the third year and undertake a major project in your fourth year, which will include a substantial piece of written work and a presentation. Students taking this programme do not have to do any practical work, although this is possible if so desired. This programme is offered as a three-year BSc or a four-year MSci degree. The first two years of the programme are identical, and students are advised to apply for the MSci degree in the first instance, as it is possible to transfer to the BSc during the first three years. All third-year modules are optional. Currently available mathematics options are described on the UCL Mathematics website. 0.5 credits of third-year mathematics options or suitable third-year physics options. All final year modules are optional. Teaching is mainly carried out through lectures and small-group tutorials. Problem classes allow you to exercise the skills you have learned. In addition, an 'office hours' system for each programme allows you to meet with tutors on a one-to-one basis to review parts of the degree that you find interesting or need clarifying. A Student Mentor scheme runs in the department offering support and advice to first-years. Most modules are assessed by two-hour written modules in the third term, with a small element (10%) of coursework assessment. Detailed course descriptions are available on the department website: Mathematics and Physics MSci. We aim to develop your skills in mathematical reasoning, problem-solving and accurate mathematical manipulation. You will also learn to handle abstract concepts and to think critically, argue logically and express yourself clearly. A mathematics degree is highly valued by employers due to the skills in logical thinking, analysis, problem-solving and, of course, numeracy, that it develops. Graduates have gone forward to use their mathematical skills in careers in the City of London, such as forecasting, risk analysis and trading; in financial services, such as accountancy, banking and insurance; and in scientific research, information technology and industry. Further study, such as a Master's degree or a PGCE qualification, is another popular option. In addition to academic requirements, we expect you to demonstrate an understanding and enjoyment of the subject beyond the examined syllabus, through your reading and involvement in problem-solving activities. Evidence of your curiosity and perseverance in tackling puzzles, and your enjoyment of logical and abstract thinking, should be shown in your application. The department is supportive of the Year in Industry scheme which involves deferring entry for a year to gain valuable work experience.